Mabu Thermas and Resort Hotel, Iguazu Falls, Brazil details from BrazilBookers.com. 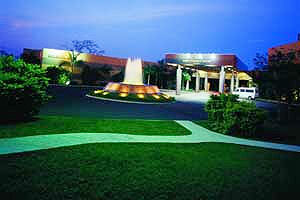 The Mabu Thermas & Resort is located at city centre, quite near the Iguassu Falls. The hotel is very famous for its thermal baths. Situated above an aquifer and the warm water it receives makes it a perfect place for the guests seeking complete relaxation. With the temperature of water being moderate throughout the year, the guests could bath at any time of the day. The hotel has 201 rooms and suites with each of these rooms fully decorated, all with mini bar, telephone, cable TV and air conditioners. Mabu Thermas also has a swimming pool and it also has a tennis and sand volley ball court. Mabu Thermas and resort is an exquisite resort in Foz do Iguacu, Brazil. It perfectly blends into the pretty surroundings. It is strategically placed between the city centre and the airport. The eco and adventure spots are all near at hand. The resort in all houses 208 comfortable rooms. The construction has been done keeping in mind the solar movement, which allows the calculated light entering the rooms to light them up naturally. There is a contemporary system of central air conditioning. For your entertainment, there is flat-panel television in all the rooms. Also you get facilities like bathroom phones, mini bar and remote control to maximum equipments. The bathroom is comfortably large with a nice shower and sink. Gastronomy is commendable. From exquisite Paranaian Cusisine to carousel; the Goldfish and the Dourado, you get to taste them all. The amazing variety presented to the guests is really a thing to be appreciated. A number of bars offer you your favorite drink too including the Piano bar, Carmen, Miranda café and many more. They offer world-class food with healthy and tasty menus. Six meals a day are offered within the all-included package. Spots lovers are spoilt too as a number of sports and fun things are available. The tennis courts, walking tracks are all there for you. This includes guided tours for both adults and children, providing fun and leisure for any age. Kids can have a gala time at the children’s club. For pampering yourself, the beauty salon, massage and health club is at your disposal. The resort features the planet's biggest thermal water spring. Everything about this place is unique, even the water you bathe in is totally renewed every four hours, and at a temperature of 36 degrees Celsius, you can bathe anytime. Also you get laundry facilities and massage treatment. The pool area is excellent and you have excellent activities for children too. The staff is absolutely adorable, eager to assist and make happy guests even with the most bizarre requests. The resort also takes care of your security. Everything, in short is taken care of. The nightlife is also worth mentioning, where, at the end of the day, the live music will soothe you to your dreams. Endless amenities and consideration towards every little personalized details that make you feel special every time, makes you feel special. A resort with adventure, made easy, at this hotel. When would you like to stay at Mabu Thermas and Resort Hotel ? 1) Rates at the Mabu Thermas and Resort Hotel may not be valid during Carnival, New Years, Easter and other special dates. © Copyright Bookers International, LLC. All Rights Reserved – Information on Mabu Thermas and Resort Hotel, Iguazu Falls, Brazil details from BrazilBookers.com.